For newcomers who are not familiar with the structure and functionality of Ethernet switch, they are apt to get confused with different ports built in for the different connection. Except for those common ports on SFP switch, such as SFP port, there is another port called “combo SFP port”. Do you know what is it and what is the difference between SFP port and combo SFP port? In this article, we aim to give you a comprehensive understanding of combo SFP port on Ethernet switch. What Is Combo SFP Port on Ethernet Switch? In a nutshell, a combo SFP port is regarded as a single interface with dual front ends, i.e. an RJ-45 connector and an SFP (Small Form Pluggable) module (also called Mini-GBIC) connector. In other words, this is a compound port which can share the same switch fabric, port number and allow the users to configure their SFP switch according to different applications. But the two different physical ports cannot be used simultaneously. 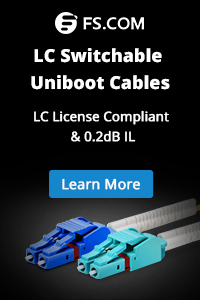 It means that you can either plug a cable into copper 10/100/1000 interface, or plug the cable into SFP slot. A combo SFP port is a way to provide different types of connectivity and give users the power and flexibility to configure SFP switch for unique application requirements. Below is the demonstration of 4 combo SFP ports on FS SFP switch. What Is the Difference Between SFP Port and Combo Port? Combo interface, also known as optoelectronic multiplexing interface which is a switch device panel with two Ethernet ports: an optical port and an electrical port. Combo electrical port and its corresponding optical port are logically multiplexed, and the user can choose which one to use according to the actual network demand. But when one of the ports is activated, the other port is automatically blocked since they can not be used at the same time. While SFP port (mini-GBIC port), a small form-factor hot-pluggable interface, is designed for high speed and density SFP connection. SFP ports on SFP switch support both copper and optical links. When SFP ports on SFP switch are inserted into SFP modules with electrical ports, Ethernet copper cables are needed for data transmission. If SFP ports are plugged by SFP optical modules with optical ports, then fiber patch cables are required. There are many SFP switches with combo SFP ports, but today we are going to take FS S3800-24F4S: 24 port switch with 4 combo SFP ports as an example to illustrate the usage of combo SFP ports on an SFP switch. S3800-24F4S 24-port Gigabit switch comes with 20x 100/1000Base SFP, 4x 1GE combo and 4x 10GE SFP+ slots which offers up to 128Gbps switching capacity to synchronously process the traffic on all ports without any packet loss. The 4 combo SFP ports on switch facilitate the application of different connectivity, making it more flexible to configure the switch. 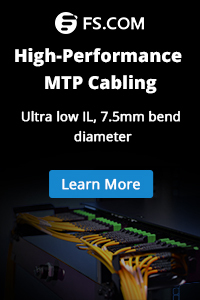 In addition, this diversiform port combination form provides a high bandwidth aggregation connectivity for multiple switches to enhance network capacity. All in all, this 24-port Gigabit managed switch is fit for enterprise network operators who pursue high performance and low power processor to provide full speed forwarding and line-dormant capacity. From the above introduction, we have known that combo SFP port on SFP switch is a port type to carry out different connection applications. For combo SFP ports on Ethernet switch, only one of the twisted pair port or SFP slot can be used. For SFP ports on SFP switch, it can be either plugged into Ethernet copper cable with RJ45 SFP module, or optical fiber cable with fiber SFP module to achieve short and long reach distance transmission. 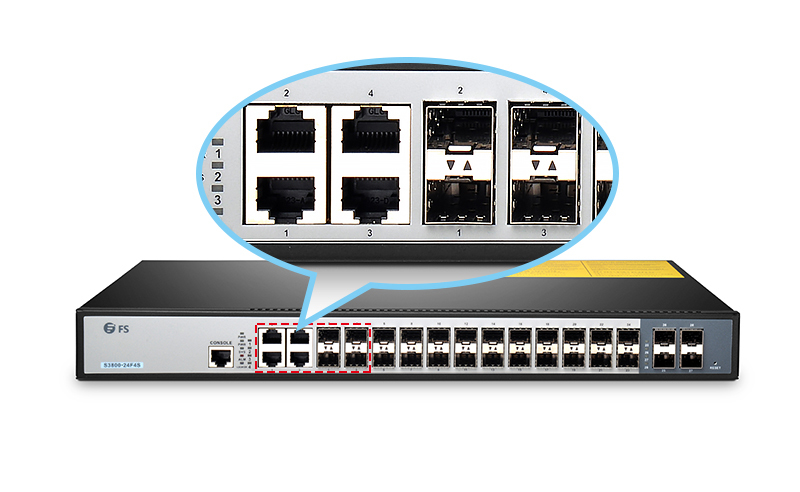 What is more, FS S3800-24F4S is a good example of combo SFP ports on the switch. If you have any need, FS would be a choice. Related Article: 1000BASE-T Switch with SFP Ports Interconnection Methods? What Does the Combo Port Mean for Your Network? This entry was posted in Enterprise Network and tagged Ethernet switch, gigabit switch, SFP Port, sfp switch. Bookmark the permalink.